Color is what Friday night’s (Nov. 2) Cincinnati Symphony concert was about. Color, rhythm and how to astonish an audience. 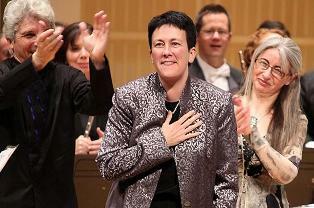 Planned by CSO creative director Jennifer Higdon and led expertly by guest conductor Peter Oundjian, the concert featured some of classical music’s greatest “painters,” Ravel, Rimsky-Korsakov and Tchaikovsky. Most of all, it starred the phenomenal percussionist Evelyn Glennie. Known to millions for her performance at the opening ceremony of the Olympic Games in July, Glennie held her Music Hall audience rapt in Higdon’s Percussion Concerto -- as rapt as those who heard and saw her perform with Underworld and the Pandemonium Drummers at Olympic Stadium in London. Even more, no doubt, for she had more than drums at her disposal at Music Hall. Arrayed in front of the CSO were marimba, vibraphone, crotales (small pitched cymbals), drums of all kinds and a special set of ear-tickling wood blocks. Speaking of which, Glennie moved from one group of instruments to the other in her stocking feet, the better to pick up vibrations from the floor. Glennie, who has been profoundly deaf since age 12, uses her whole body as a resonating chamber, not needing to depend on her ears to detect sound. Higdon’s Concerto (a 2005 Grammy-winner for best contemporary classical composition) involved CSO percussionists David Fishlock, Richard Jensen and Mark Wolfley as collaborative artists, and Glennie worked closely with them throughout. It began almost inaudibly with Glennie on marimba, joined gradually by her percussionist colleagues. Leonard Bernstein came to mind as the work unfolded, setting up a delightful, melodious din in the capacious, welcoming hall. The second movement utilized bowed vibraphone, i.e. with the player drawing a bass bow up the side of the instrument to produce a clear, penetrating sound. It was an ethereal moment, with muted CSO strings, gentle woodwinds and harp harmonics, like Mother Nature in a peaceful mood. The spell was broken in the final movement, which featured an improvised cadenza where Glennie addressed the drums with beaters, fingers and hands and a progressively jazzy buildup to the end, which drew whoops from the audience. There was a Spanish accent (via Paris and St. Petersburg) to much of the program, which also included Ravel’s “Alborada del gracioso” and Rimsky-Korsakov’s “Capriccio espagnol.” The former, translated “Morning Serenade of the Jester,” opened the concert with the harp and plucked CSO strings simulating a great big guitar. The winds sounded the perky serenade, which ended with a humorous retort by the brass. “Capriccio espagnol” is a kind of display piece for orchestra, with brilliant solos and lots of swagger and Spanish soul. Acting principal clarinetist Jonathan Gunn was a standout here, as were associate concertmaster Rebecca Culnan, harpist Gillian Benet Sella, principal flutist Randolph Bowman and the magisterial CSO brasses. Oundjian delivered a brilliant performance, generating enthusiasm-to- burn from the podium. Tchaikovsky’s “Francesca da Rimini,” not heard at the CSO since 1980, closed the concert. A tone poem inspired by the love story of a real-life, 13th-century woman, as re-counted in Canto V of Dante’s “Inferno,” it was 25 minutes of roiling emotion. It opened with eerie brass, and you could feel torrents whipping through Music Hall as the poet describes the suffering of Francesca and her lover Paolo (doomed to be lashed by eternal winds forever in the second circle of hell). Clarinetist Gunn led beautifully into the touching “Francesca” theme, which Oundjian built to a radiant climax. The intensity was almost unbearable at the end as the tale (which ends in the lovers’ death at the hands of her husband) reached its shattering conclusion. The concert – a choice one – repeats at 8 p.m. tonight at Music Hall. Tickets, beginning at $10, are available at (513) 381-3300 or visit www.cincinnatisymphony.org.